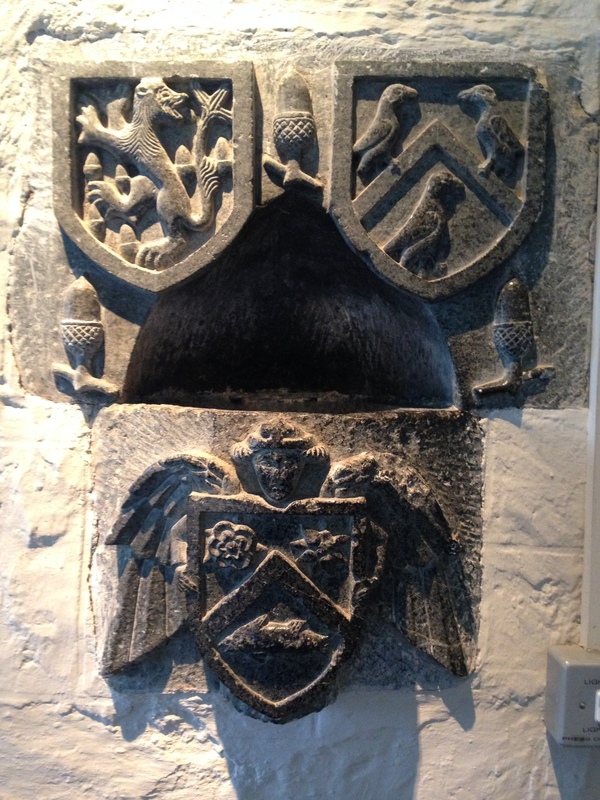 I’d heard about the late medieval sculpture that exists in a handful of churches in North Cornwall but until recently hadn’t seen any of it first hand. 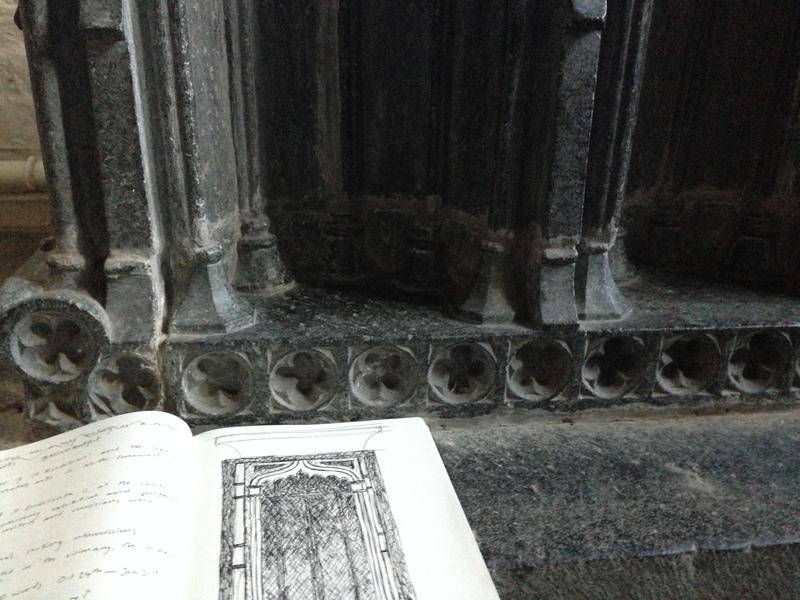 Because of the excellent North Cornwall Book Festival at St Endellion over the weekend I had the opportunity to combine my love of books and writing with my love of Gothic stone carving, clearly a win-win situation. When the church was empty one afternoon (it was great to see it used as a performance venue for the speakers and musicians, as well as hosting an exhibition and printmaking workshops) I was able to take a closer look. Some of the most distinctive stone sculpture of the period (14th-15th century) in southwest Britain exists scattered throughout a few churches on this stretch of coast. At the church of St Endelienta in St Endellion there is one of the best, perhaps the most unusual, example of this group. This is the chest or shrine tomb in the south aisle, currently used as an altar. It represents the work of one sculptor whose name is now lost to us, and who is known today simply as the ‘Master of St Endellion’. Around the period that this was produced, c.1400, this carver worked a number of other pieces that can be found at the nearby churches of St Issey, Padstow, and St Merryn. The stone is the charcoal black Cataclews/Catacleuse stone from the area around Trevose Head on the north coast, which, judging by the few pieces used for this tomb, was clearly able to be quarried in large blocks. Personally, I love the dark coloured stones. Some find them gloomy, and there’s no doubt that they gather up a particular depth of shadow, but I find that this is often balanced out by their ‘softness’ and subtle tones. Most workable stones in the south of England tend to be the light-coloured limestones from Bath, Portland, or Beer, which range from warm creams to pale browns. Darker-coloured stones are more unusual. In Cornwall, because of its complicated geology, there are a few, although most (including Cataclews) are no longer quarried. 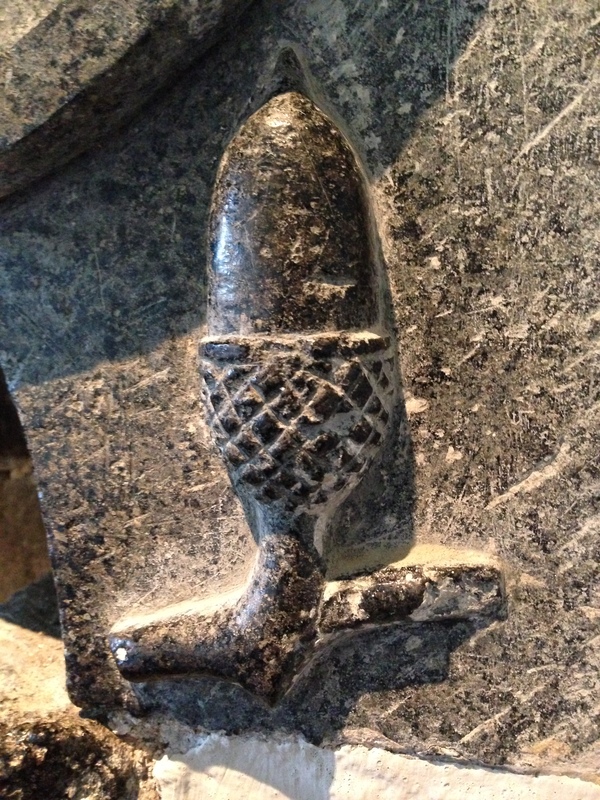 Cataclews, is, however, an exceptional carving stone, as this piece at St Endellion demonstrates. Certainly, it’s an outstanding piece of work and full of character. The presence of a human hand is all over it: the ogee arches on the altar, three each on the front and the back, one on each side, have a slight asymmetry; some of their tiny capitals lean into the curve instead of being horizontal. 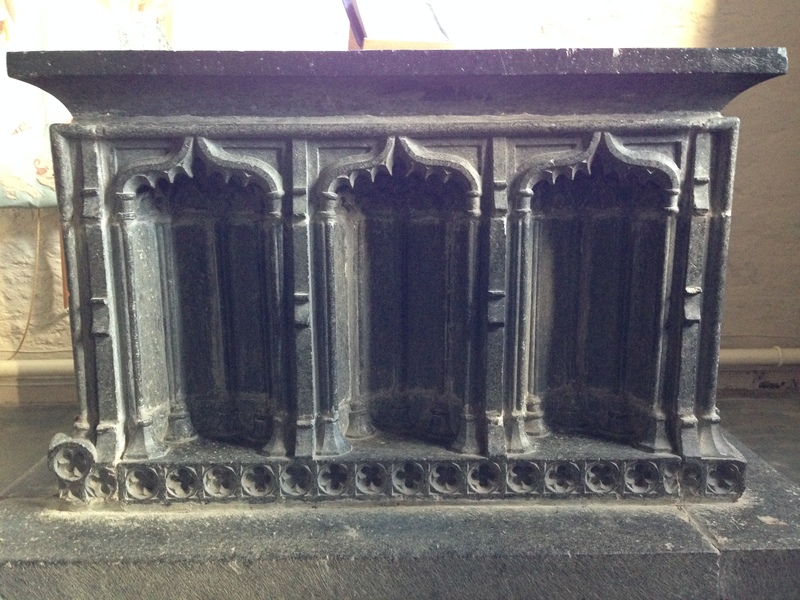 Other nuances include the repeating quatrefoil pattern that runs along the base. It is the spectacular level of detail which repays a close look and is, according to the Pevsner Buildings of England guide, ‘as delicate as if it were of cast iron’. The whole tomb represents weeks and weeks of work for one carver (and it probably is one, as the same stylistic ‘mistakes’ are consistently repeated). It is a small miracle that it has survived the centuries in such good condition. The same hand produced the water stoup just by the door carved with the heraldic shields of the Roscarrock, Cheney, and Pentire families, enlivened with glossy black acorns. This is high status work. 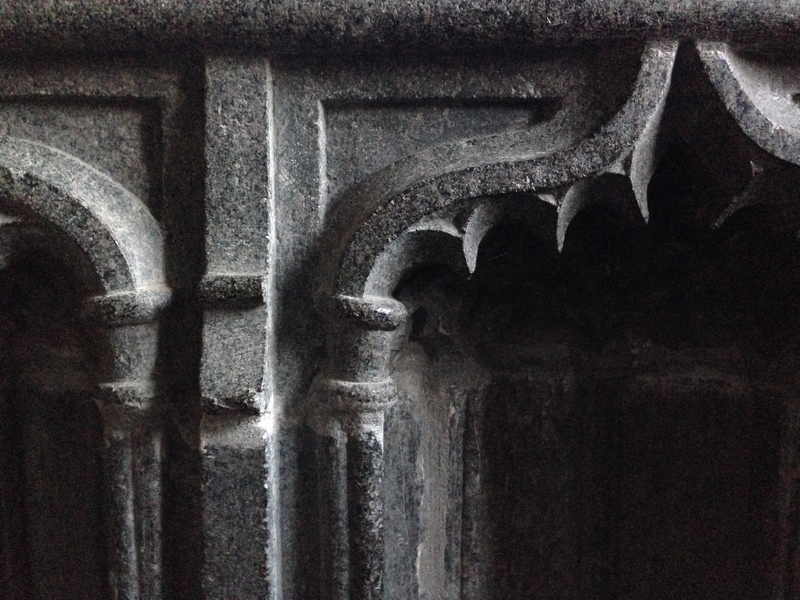 What it suggests is that Cornwall was not cut off from the fashions affecting art in the medieval period, and that, moreover, carvers were organising themselves at a local level around good sources of stone. 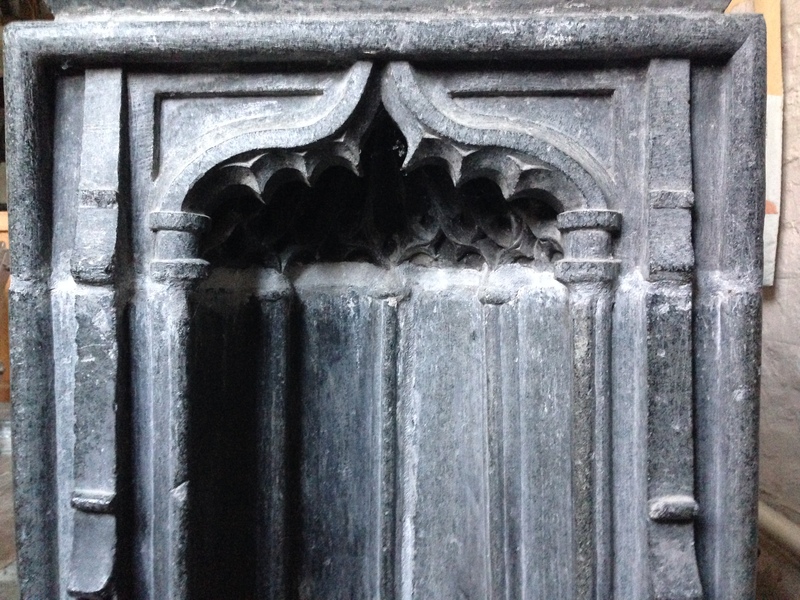 Like so many of our talented medieval stone sculptors the ‘Master of St Endellion’ remains silent and anonymous in the historical record, but in the cultural and archaeological record is anything but, the work lending a distinct quality to the interior of the church and the creative arts that are still celebrated here.